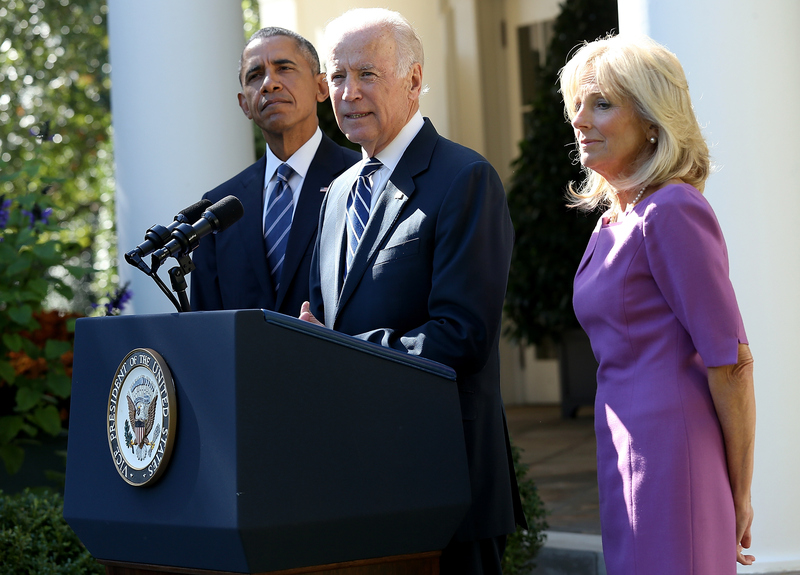 Joe Biden's speech Wednesday, during which he announced that he won't run for president in 2016, may at first seem like a simple, heartfelt series of statements about the loss of his son and improving the situation of the American middle class. But a closer read of the speech reveals subtle jabs at former Secretary of State and current 2016 presidential hopeful Hillary Clinton, as well as at Republican politicians. Biden's speech was more political than you might have realized, because he worded it in an incredibly clever way. One of the most obvious jabs came at the beginning, when he said that Democratic presidential candidates should embrace "the Obama legacy," and that they "should run on the record" of President Obama's achievements in 2016. The statement could be seen as a jab at Clinton, who has recently opposed Obama's decision on the Trans-Pacific Partnership trade deal and has criticized several of Obama's other policies. But the statement could also apply to presidential hopeful Vermont Sen. Bernie Sanders, who said in September that Obama was "naive" about negotiating with Congressional Republicans. "These guys never had any intention of doing [serious] negotiating and compromising," Sanders said of John Boehner and Mitch McConnell in an interview with David Axelrod. Biden made what could be seen as a stab at Sanders again later in the speech, saying that "compromise is not a dirty word," and adding that working with Republicans is essential to a successful democracy. He said, "I don’t think we should look at Republicans as our enemies. They are our opposition, they are not our enemies." His words stand in contrast with Sanders' statement, and they also serve as a criticism of Clinton. At last week's Democratic presidential debate, Clinton said "probably the Republicans" when asked which enemies she was most proud of making. It wasn't just the Democratic presidential candidates Biden spoke against, either. He said that "we cannot sustain the current levels of inequality that exist in this country," adding that "the middle class will never have a fighting chance in this country as long as just several hundred families, the wealthiest families, control the process." That sentiment is a lot different from that of, say,Jeb Bush, who said earlier this year that inequality exists because some Americans are trapped in "perpetual dependence" on the government. And Biden's statement that "the huge sums of unlimited and often secret money pouring into our politics is a fundamental threat to our democracy" seems like a pointed attack at the one percent, as well as campaign PACs. Biden's criticisms transcended party lines. The vice president stated multiple times that he didn't have enough time to mount a winning campaign for president next year. The statement served as a criticism of the entire election process — more than a year ahead of the election isn't enough time? — and also as a criticism of the ridiculousness of campaign funding. The statement suggests that a year may not be enough time to raise enough money to run a successful campaign. Yes, Biden's speech was incredibly moving and heartfelt. He was honest about the loss of his son, and he showed his passion for improving the American middle class. But his speech was still a political one — and his savvy jabs at various politicians and political mechanisms shouldn't be overlooked.